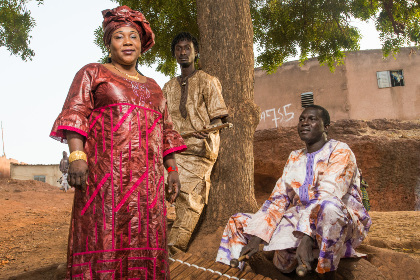 Trio Da Kali exemplify the continuing vitality of the Mandé griot culture of southern Mali. They represent the next generation of the centuries-old tradition of specialist hereditary musical artisans, story-tellers, regalers of the news and custodians of history. The sublimely soulful voice of the trio belongs to Hawa Kassé Mady Diabaté, daughter of Malian musical giant Kassé Mady Diabaté, and the deep funky tones of Africa’s oldest string instrument, the bass ngoni are skillfully pumped out by Mamadou Kouyaté, the son of internationally renowned maestro Bassekou Kouyaté. The trio is led by Mali’s foremost player of the 22-key balafon, Lassana Diabaté. Originally formed for a collaborative project with Kronos Quartet, Trio Da Kali have gone on to perform at some of the world’s most prestigious venues. Steeped in history, dripping with dexterity and vitally contemporary.